Me posing in front of the D's trailer. I was so happy to discover it in a parking lot. Had to stop for a photo op!! I like to buy boiled peanuts all around Georgia. Roadside stands run by folks who could pass for my great grandparents and local guys like David of D's Nuts. He always has interesting flavors (jerk, jalapeno, Cajun and more!) I like buying from these people because I'm supporting the local economy and enjoy making new friends. Many Flavors of Boiled Peanuts in GA.
Great photos and vendor tip about D's Boiled Peanuts. We'd love to try the jerk flavored boiled peanuts. We agree, support your local vendors. Every pint of peanuts they sell is important to them paying their bills. In this economy every dime makes a difference. 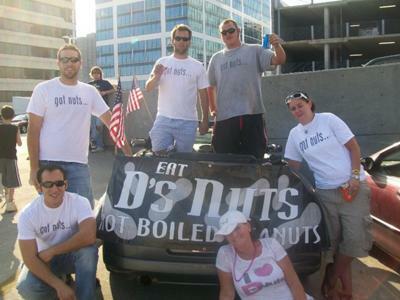 All of you Metro Atlanta boiled peanut lovers go right now and visit D's Nuts and buy some boiled peanuts. Comment here when you do. Send photos if you can. Thanks for the boiled peanut vendor tip, Andi! We are a great support of your company but have had a hard time finding you. We love your hot salty nutz. Reach out to the world so that we can find you again.